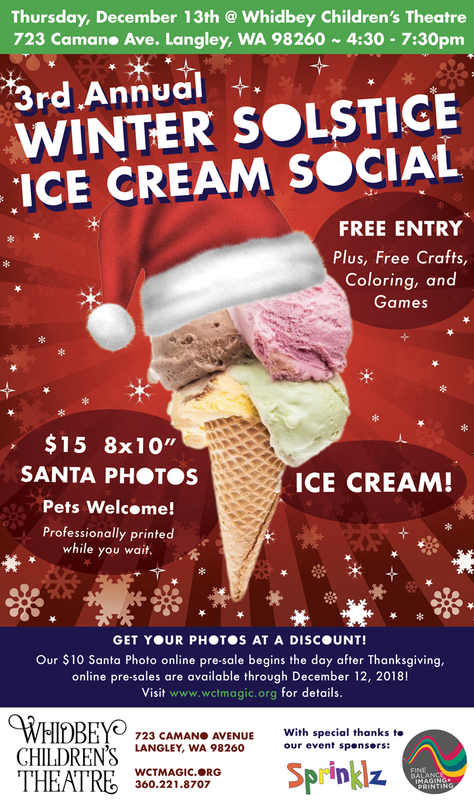 3rd Annual Winter Solstice Ice Cream Social with Santa! Santa Photo pre-sale begins Friday, November 23rd @ 12:00am and runs through Wednesday, December 12th @ 4:30pm; details below. Get your holiday picture taken with Santa! $15 for a beautiful glossy 8 x 10 full-color print. Photos taken by Joe Menth of Fine Balance Imaging Studios - printed while you wait, or ready for next day pick up at FBI. All human and furry family members are most welcome to sit with Santa, and reveal to him what sparkly things they would like to receive during this season of special magic. While you wait for Santa's ear, enjoy a warm beverage, and a generous scoop of delicious Sprinklz Ice Cream and Coffee Shop Ice Cream! Half of all proceeds from ice cream sales go directly to WCT programming. GET YOUR PHOTOS AT A DISCOUNT! $10 Santa Photo pre-sale starts Friday, November 23rd @ 12:00am, ends Wednesday, December 12th @ 4:30pm. Online: Your name will be on a will call list at WCT when you arrive.